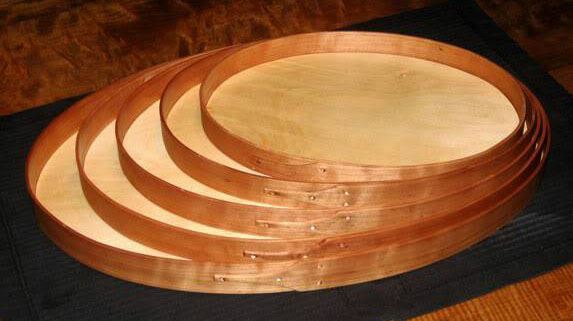 Make a set of nesting oval trays as you learn the basics of bending wood with moisture and heat. These elegant trays are perfect for gift-giving, or you can use them to serve snacks or confections or to display collections or decorations.You will go home with four trays, ranging from approximately 7½ by 11 inches to 15 by 21¾ inches, with cherry rims and maple bases. On the first day, you will make forms for bending your trays, so that you can make additional sets later if you wish. You will also cut, feather and bend the rims, and learn the tricks of fastening the hoops with copper tacks, using an anvil and hammer. On the second day, after the rims have dried overnight in the forms, you will cut and fit the bases so they snug tightly within the rims. And then you will peg the rims to the bases and sand everything smooth in preparation for finishing at home. The instructor will discuss two finish options: shellac and wipe-on polyurethane. * Open to those who have taken our free, one-hour Orientation to the Woodshop class and Woodshop Tool Safety Checkout 2. If you have not taken these classes, please register for them before you sign up for this class. Instructor: Thomas Scott is owner of Fremont Occasional Woodworks, a shop in the Fremont neighborhood in Seattle where he makes and sells Shaker boxes, furniture, walking sticks and other wooden items. His website includes a link to his blog about all things woodworking.